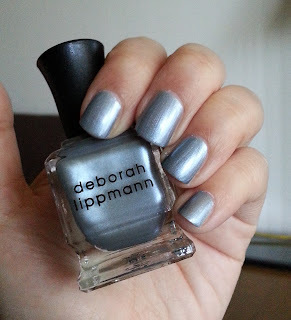 NOTD is Deborah Lippmann Moon Rendezvous from the new Romantic Capture Spring 2013 Collection. Once I had it on, I never wanted to take it off! This is described as a faded slate blue shimmer and my mani lasted for almost a week. I only own one other Deborah Lippmann nail polish and I definitely need to buy more. Deborah Lippmann Moon Rendezvous retails for $17.